Seafood salads are an excellent way of making sure you get your protein, maybe some omega oils and some portions of vegetables. You can add carbs if you want them in the form of pasta, crusty bread or plain baked or boiled potatoes. It's a good way of getting a well balanced meal and when the weather's hot, you don't have to spend ages in the kitchen with hobs, grills and ovens making you uncomfortable. 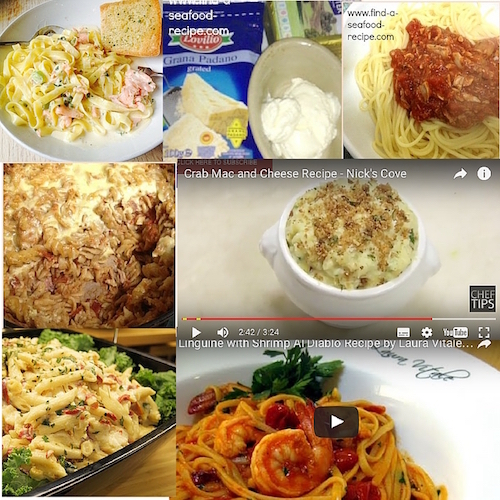 These recipes are wonderful - seafood salad - what does it mean to you? To me, it means platters of fresh fish or shellfish with crispy salads eaten in sunshine with not a care in the world, gazing out over a wonderful vista of hills with the sea in the distance; or balmy summer evenings sat on the verandah, peaceful, warm and with good company. 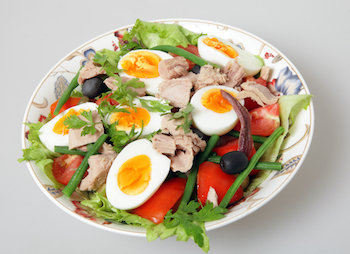 Tuna Nicoise is a classic seafood salad. 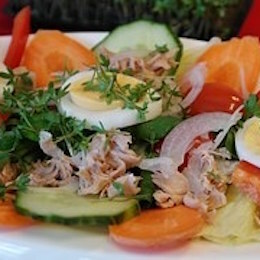 It combines succulent tuna with creamy boiled egg, crunchy french beans, tomato and lettuce. Add black olives and anchovies then pour over the dressing. Serve somewhere calm and warm with crusty bread and a nice glass of something cold! 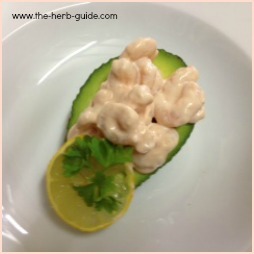 Juicy shrimp in a marie rose sauce served in half an avocado, can be an appetiser if you serve half or a main with a whole avocado. This shrimp salad recipe could just as easily be used as a shrimp cocktail appetizer served on a bed of chopped lettuce. The Marie Rose sauce is excellent as a dip if you're having a session in front of the television. 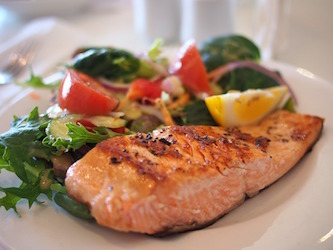 One of the most popular searches on my site is salmon salad recipes. 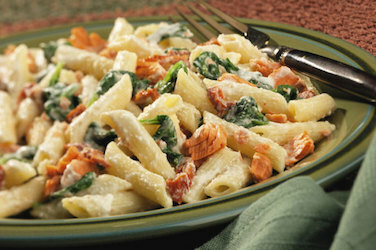 You can use fresh or canned salmon for this recipe. If you use canned, then tip it out onto a plate and separate the skin and bone before you flake it and mix it into the salad. This is a great dish to take for a potluck or as part of a buffet as you can easily multiply the ingredients to cater for loads of people. There is something about smoked salmon that is pure luxury and it's so easy to find. Many supermarkets have special offers - buy one get one free or a discount - plus you can normally find offcuts - the trimmings - which are great if you're going to chop it up anyway for a pate, fish cakes or quiche. If you buy a pack, then it freezes very well. Split it into slices and freeze them separately and just bring them out to defrost on the counter or in your refrigerator. It won't take long because the slices are so thin. 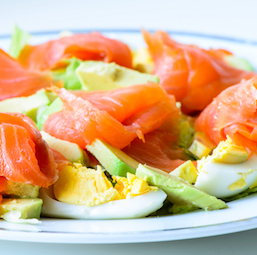 This recipe for a Smoked Salmon Salad is better with proper slices - either packs or a small side - about 400g in total. A basic but very versatile seafood pasta salad using canned tuna, peas and mayonnaise. You can ring the changes with this one, use dill or parsley instead of chives, canned salmon or defrosted cooked shrimp. Canned corn instead of the peas - seriously, you could eat this every week and it would be different! Really quick to cook, around twenty minutes to cook and cool the pasta, then mix it all together. There's a great mixture or spinach and sun dried tomatoes and it's all combined together with ricotta cheese to make it creamy. 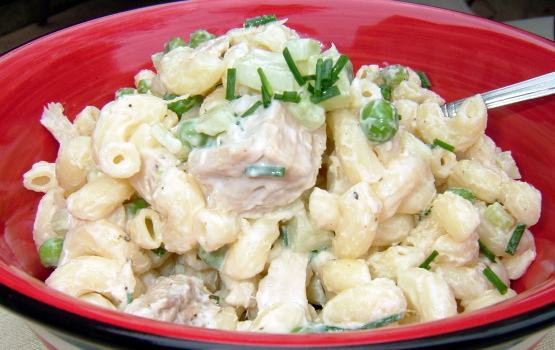 You could substitute fresh or smoked salmon or canned tuna to this dish. I love the mixture of warm salmon with cold salad. You could use trout or canned fish here. Tuna would be good - canned salmon would give you the Omega 3s as would fresh tuna.